The last two games have seen the Pistons' biggest rotation changes that Stan Van Gundy has shown this season. They've also been outright disasters, but for different reasons and only occasionally because of the roster changes. Before the season began, SVG planned to bring Greg Monroe off the bench, but injuries to Jodie Meeks and Cartier Martin forced Josh Smith into the small forward position. Several moderately successful schematic changes later, the Pistons are still only 3-14 and stuck in a rut. What followed was one of the Pistons' worst performances to date. Brandon Jennings' absence due to a dislocated thumb should not be understated, but the Pistons' second unit was one of the worst groupings the team has ever put on the floor. Detroit actually won the 1st and 3rd quarters, the two in which the starting rotation played primarily. 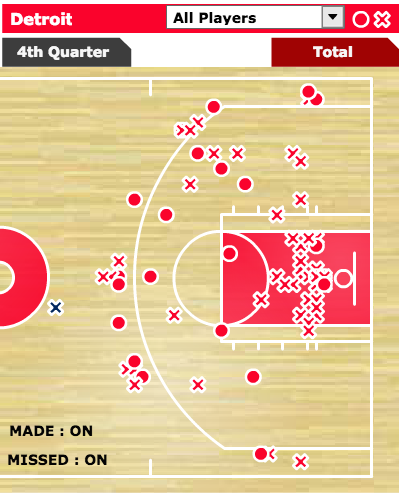 But the 2nd and 4th quarters, each which opened with the Drummond-led second unit, were devastating. The Pistons lost the 2nd quarter 16-28, and the 4th quarter 19-30. The highest plus-minus of any bench player was -14. The lowest of any starter was -2. Things were so bad with the second unit--one issue was the Bucks playing Giannis Antetokounmpo at center, something Detroit's bigs were ill-equipped to deal with--that SVG chose a frontcourt of Smith and Jonas Jerebko, a pairing that, to my knowledge, hasn't played together this year. It's not often that I feel compelled to turn off a Pistons game, but watching the team against the Bucks nearly forced me to. The team looked so dysfunctional on the defensive end of the floor that it was hard to believe 15 games had already passed this season. I believe that the Pistons are starting to put things together. SVG has solved the Josh Smith problem, using him as the roll man in pick-and-roll situations and generating open shots. He has also improved Drummond's off-ball defense and rediscovered what made the big man so effective the previous two seasons (playing as a weakside offensive rebounder). Things aren't going well, but SVG shows high-level tactical thinking and, once he has the team that he had a hand in building (Jodie Meeks' return looms large, as does Cartier Martin's continued health and improvement), this season's outlook should revert to the preseason mean. That performance around the rim happened in part because Andrew Bogut is an exceptional rim protector, but it points to an ongoing issue with the Pistons' bigs: they're terrible around the rim. My least favorite thing that happens on any basketball court is players complaining to the refs for a foul call. It's something that Monroe does dozens of times per game. Drummond and Smith have begun doing so as well. The team believes they deserve more calls than they're getting, and they might, but this team appears to have a reputation among refs. They're not going to get calls. So when the team gets a 12-32 performance from their big men (Smith 6-18, Drummond 1-8, Monroe, 5-12), it may be because they're not getting enough calls. More likely, it's because they're bad at finishing around the rim. Monroe's inability to finish at the rim remains the worst aspect of his game. Having a traditional post-up big man that's not efficient or even notably above league average at the rim is the surest way to drive an offense into the ground. Monroe never developed a reliable face-up game, and his finishing ability remains problematic for a player of his skill. I am not implying that Monroe is responsible for that Warriors game shot chart, nor that he's the culprit for the Pistons' long-term problems, but he's a major factor and contributed to the team's issues around the rim. The consistency issues that the Pistons face do not lie solely on Smith or (unfairly this season) on Jennings. The team has problems almost across the board, with only KCP proving to be the team's consistent performer. 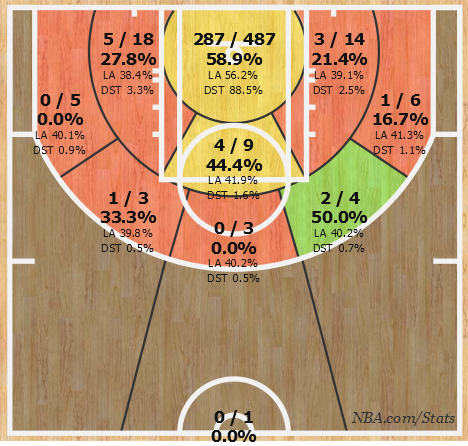 In spite of his 2-16 start from behind the arc, KCP has improved his outside shooting percentage to 36.4% (40.9% if you excise his first three, knee-recovery games)*. In addition to his NBA Defensive Team-caliber defense, KCP has quietly become a consistent threat on the offensive end. Consistency is an expected problem on a team this young, though, and it's SVG's job to both coach the players on mechanical problems and develop systems that they feel comfortable in. 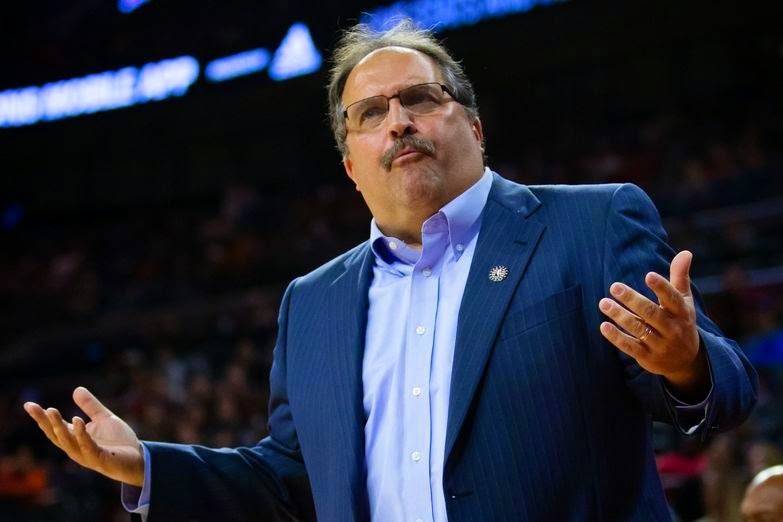 The Bucks game notwithstanding--and it should hardly count against Detroit; few opponents will be able to play a 6'11" small forward at center--SVG has shown a willingness to experiment with what brings an individual's skillset in line with how the team performs. Having already solved two of the most difficult roster pieces, it should not take much more time before he has a playbook that works for the entire team. At this point, the losses are as beneficial as the (hypothetical) wins. The Pistons are learning and SVG is learning with them. It is only a matter of time before they figure it out. * A note about KCP's play that I think is important to watch: where he catches the ball on catch-and-shoot attempts. I struggled to find what was wrong with his shooting stroke for most of this season, but it dawned on me during the Bucks game that he needs to receive the ball high in his shooting stance to hit outside shots with consistency. When he has to reach down to grab the ball and begin his shot from a crouched position, he invariably misses. But if he receives the ball near his chest, his shot is much more effective. With Smith as the roll man who usually makes passes to the perimeter, this can be a problem. In spite of Smith's exceptional passing acumen, he's still prone to throwing low passes. He will need to improve the accuracy of those driving kick outs for KCP to take the next step.